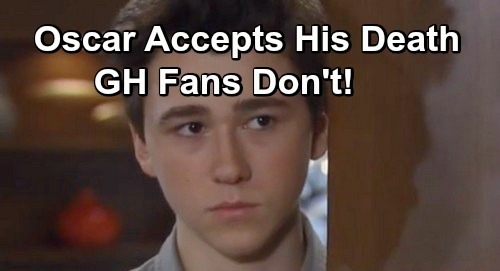 General Hospital (GH) spoilers tease that Oscar Nero (Garren Stitt) will have to face his fate. Dr. Terry Randolph (Cassandra James) just delivered some tough news to Oscar, but it’s good that she didn’t sugarcoat it. Oscar needs to know what he’s up against, even if it’s painful. At least that way Oscar has a chance to prepare for the inevitable and say his goodbyes. Oscar already shared a touching moment with his mom, Dr. Kim Nero (Tamara Braun), but there are more to come. He’ll want to spend as much time as possible with those closest to him in the coming weeks. That certainly includes Kim, Drew Cain (Billy Miller) and Oscar’s beloved girlfriend, Josslyn Jacks (Eden McCoy). It’ll be hard for all of them to come to grips with this, so they’d better start now. Oscar only has about four to six weeks left to live. General Hospital spoilers say Oscar may try to squeeze in another bucket list item or two, but he’ll have to be careful. He’s obviously at risk for more seizures, especially as his death draws nearer. Terry really knows her stuff, which is why all her info and warnings have been accurate so far. She told Oscar his next seizure would likely be worse and more debilitating. Sadly, that tells GH fans what to expect as well. General Hospital spoilers suggest that the end of Oscar’s heartbreaking story will leave him exhausted and incapacitated. It should be devastating for Joss and his parents to see him like that. However, Oscar will bid farewell to everybody before that happens. He’ll take time to show each loved one how much he cares, and they’ll share how much they’re going to miss him in return. Josslyn may secretly lean on Cameron Webber (William Lipton) throughout this nightmare. She’ll want to stay strong for Oscar, but she’ll be crumbling over the imminent loss. Based on the look Oscar gave Cam and Joss in Tuesday’s episode, March 19, he can tell where things are headed. Oscar may even give Cameron his blessing to date Josslyn once he’s gone. He wouldn’t want Joss to get stuck in grief. Oscar only wants happiness for Josslyn, so he may make plans for her future before he departs. General Hospital spoilers say some difficult scenes are ahead, so GH viewers will want to have their tissues handy down the road! We’ll give you updates as other details emerge. Stick with the ABC soap and don’t forget to check CDL often for the latest General Hospital spoilers, updates and news.